On May 18, Fr. Kevin McCracken, CM, and a group of pilgrims will begin the Association’s pilgrimage of prayer and remembrance to France. 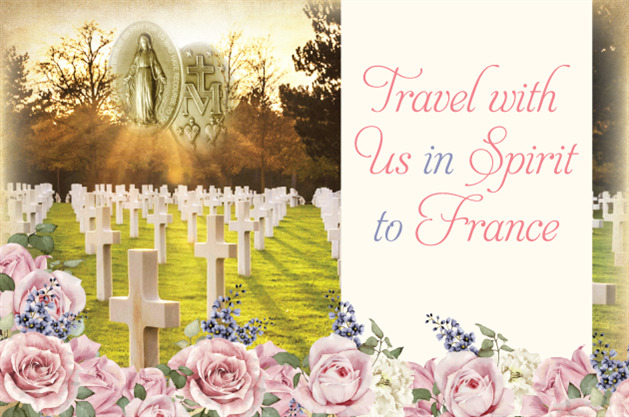 Highlights of the journey will be the Chapel of Our Lady of the Miraculous Medal in Paris, the Basilica of Saint Thérèse of Lisieux, the beaches at Normandy, and the grotto at Lourdes. Read Fr. Kevin’s letter about this spiritual journey. We hope you will join us in spirit and prayer on this journey of faith by sending your petitions to be remembered in the Masses offered during the pilgrimage. In commemoration of this pilgrimage, we are offering three new gifts— a Pink Imitation Murano Glass Bead Rosary, a Black Wood Bead Rosary, and a Pink Imitation Murano Glass Bead Chaplet. All gifts requested will be held at our office until after the pilgrimage so they can be blessed with water from Lourdes. Gifts will then be mailed to you. Follow the pilgrimage itinerary, and recite the prayer to Our Lady of the Miraculous Medal each day of the pilgrimage. You can also follow Fr. Kevin and the other pilgrims each day of their pilgrimage on our homepage, Facebook, or Twitter.